Cong you bing or Chinese scallion pancake is a savory, unleavened flat bread made by folding chopped scallions in dough, flattening it and pan grilled until golden brown. I haven’t taste an authentic cong you bing and my first encounter with this was when watching Exploring China in Youtube. It seems simple to do with little ingredients and with no special procedure needed. Simply mix water with flour and knead. Fold in the scallion and pan grilled and that’s it. This afternoon, after doing my usual weekend choir, I decided to make this dish. When I woke up my dad already went to the market and luckily he bought scallions for our lunch. I asked him to spare some of the scallions but still it’s not enough. My available scallion is about a fourth of a cup which is by far to 2 cups needed for the recipe. I searched for an alternative in our fridge and found this lonely piece of carrot that’s been sitting in the fridge for a week now and waiting to dry out. I grabbed the carrot and quickly used my imagination. I will add this carrot to the cong you bing. 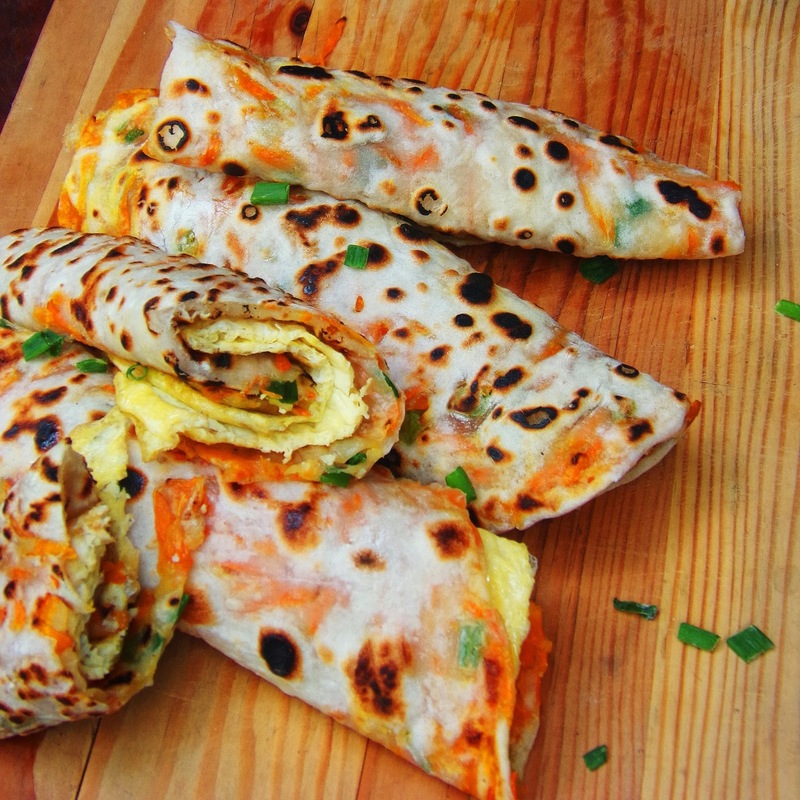 I shredded the carrot and imagined how it will add some nice orange color to the pancake. 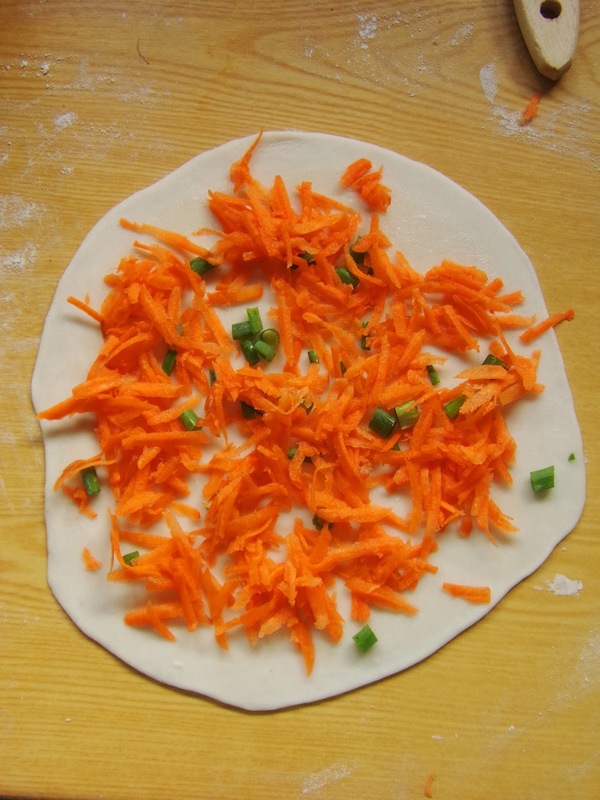 Yup, some green colored scallion and some nice shredded orange carrot equals a nice tasty looking pancake. scallions to the scrambled egg will be much tastier than plain scrambled egg. Combine flour and salt. Give it a quick whisk to combine everything. 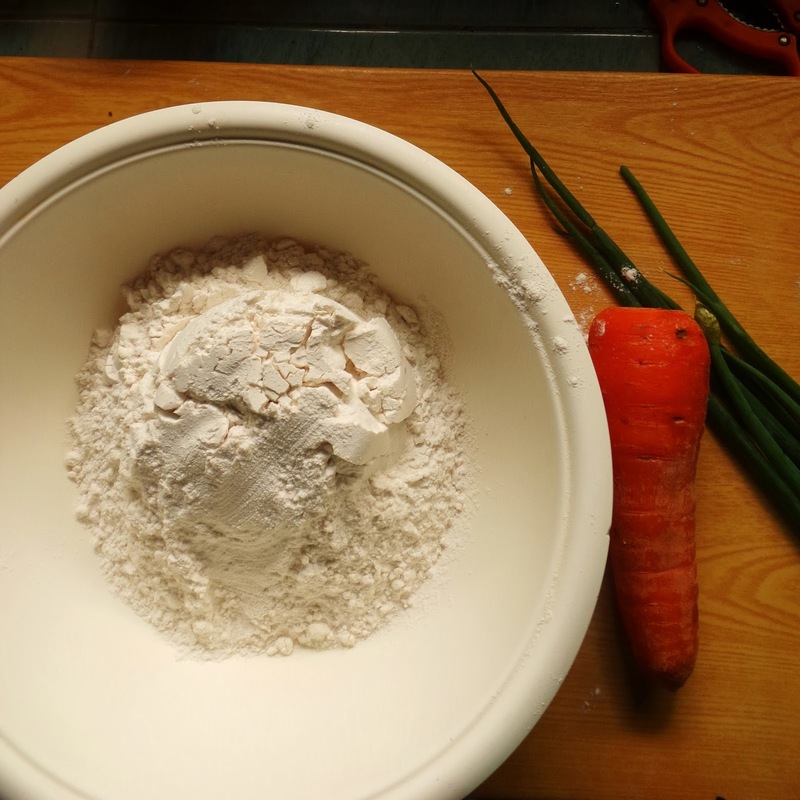 Make a well at the center of the flour mixture. Pour the hot water into the center of the flour mixture. Using a fork, mix until everything comes together. 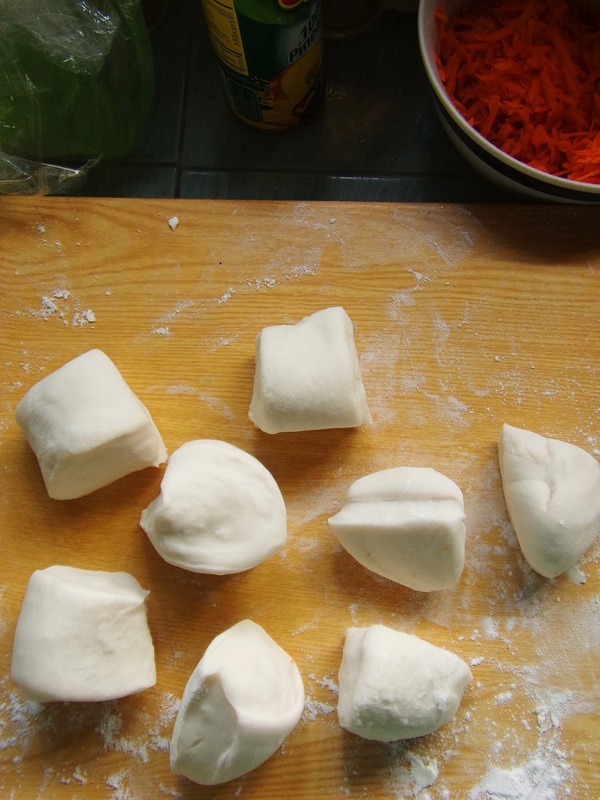 If the dough becomes too sticky, simply use your hands but be sure the dough is at workable temperature. Knead the dough until smooth and it does not stick to your hands. Add some flour if needed. Knead for about 8 to 10 minutes. Wrap the dough in a plastic wrap and rest for at least an hour. 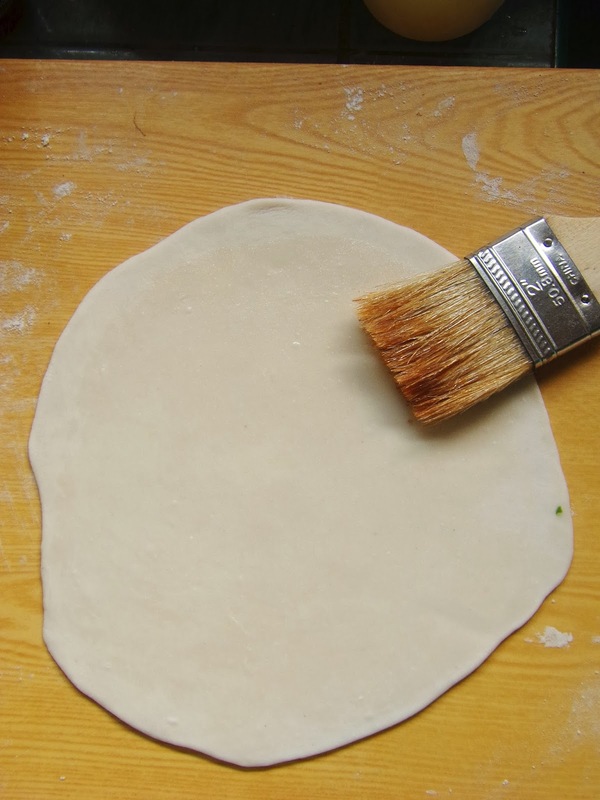 Roll the dough and flatten it using a rolling pin. Brush the surface with sesame oil. Add in shredded carrot and chopped scallions. Roll and coil the dough. 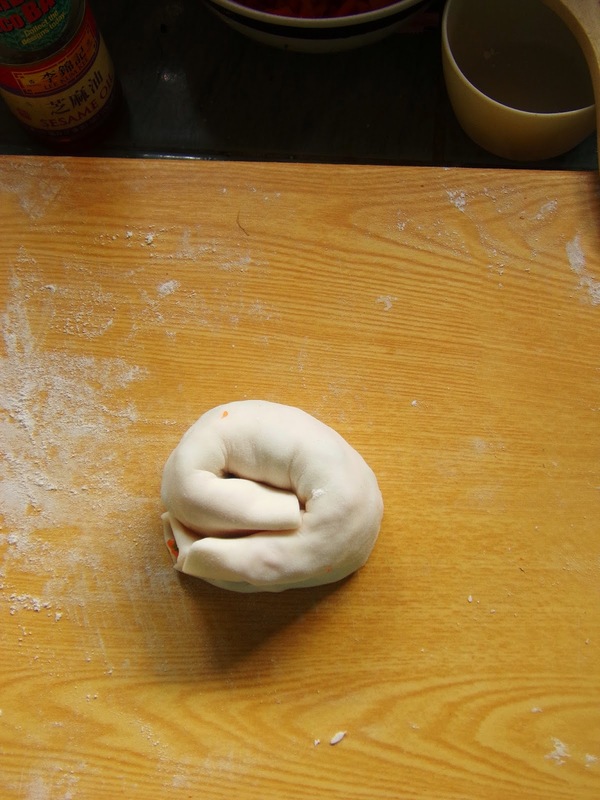 Flatten this coiled stuffed dough using a rolling pin. Pan grilled the pancake until cooked. Beat eggs, salt and sesame oil. Fry in to thin sheet, about quarter of a centimeter. Topped this on the grilled pancake and roll.